At Back to Health Center, we strive to help you and your whole family achieve your health goals. To give your body what it needs to feel incredible, we provide a broad range of services. We may recommend using a combination of them for your greatest benefit. Read on to learn more about the services we offer, or if you’re ready to book, get in touch with our friendly staff to make your appointment. Whether you suffer from pain or simply want to feel your best, our chiropractic team provides comprehensive, effective care. We also specialize in prenatal and pediatric chiropractic. 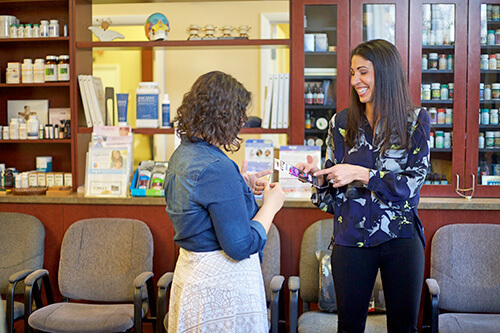 Dr. Shara and Dr. Shawnté have advanced training in many methods, ensuring we have the ones that are most appropriate for you. If you prefer a certain spinal adjustment style, we’re happy to accommodate you. We’ll walk you through what to expect and describe the technique we recommend before starting. Often used on athletes, Kinesio® Tape is available in a variety of colors. It’s applied to the problem area, giving warmth and support to decrease any symptoms you may be feeling. Used in conjunction with chiropractic care, our patients experience better recovery times. The massage therapists on the Back to Health Center team are experienced in freeing people from a cycle of pain. Both chronic and acute problems can benefit from massage, and it works hand-in-hand with chiropractic care. There are different types of massage therapy affecting the body in various ways, with many offered at our practice. The Back to Health Center team includes a Doctor of Acupuncture who is highly trained in evaluating your health and well-being. Acupuncture works ideally when paired with chiropractic to give you an incredible healing experience. Discover more about acupuncture to improve your health and relieve discomfort! Facial Cupping, like regular cupping, is designed to increase circulation to muscles and tissues. Facial Cupping uses very small cups to enhance blood flow to the face and neck area, to tighten and tone the skin, and return it to a more youthful state by stimulating collagen and elastin production. Cups are gently guided across all areas of the face and neck, creating a very light suction that feels both relaxing and tingling at the same time. Facial Cupping relaxes tight facial muscles, reduces puffiness, smoothes fine lines, moves out stagnant lymph fluid and toxins, and clears the sinuses. Each treatment concludes with a “Guasha” Jade Massage to cool the skin and create a healthy glow! Start feeling better today — contact our team to schedule your appointment! Saturday times are available.